Add another $195.00 and shipping is free! Vital Greens is a nutrient and enzyme-rich, complete `Superfood` which contains 76 nutrients essential to deliver optimal health, energy and vitality to every cell in the body. Maximum absorption and bio-availability of nutrients in this form compared to tablets and capsules. Majority of nutrients are food sourced. Correct ratio of minerals and trace elements. Detoxifier/Cleanser - detoxifying and gently cleansing your colon, liver and working on every single cell in the body. 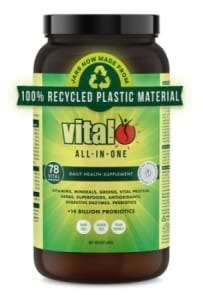 The unique combination of nutrients will help your body progressively eliminate waste which builds up on the bowel walls, cleansing the liver which is the body`s main filter organ and emulsify fat helping to maintain healthy cholesterol and blood pressure levels. Energiser/Alkaliser - Vital Greens contains many superfoods to help give you more energy, feel more vibrant and less sluggish and stressed. Alkalinity is promoted which results in feeling more balanced and alive. Well-Being Promoter - Vital Greens contains potent antioxidants, adaptogenic herbs boosting stamina, endurance and the immune system. Powerful phyto-nutrients building health from the very basics of the cell. There are no less than 2 pro-biotics in Greens. Mental Acuity Sharpener - Vital Greens contains Lecithin, Rosemary and Co-Enzyme Q-10 which may help increase mental acuity, focus and concentration. Ergocalciferol (Vitamin D2) - 92i.u. Contains certified organic ingredients. Some ingredients are not certifiable or not certified organic. Adults - Dissolve 10g (two heaped tablespoon) into 200-300mls of water, non-acidic juice, or milk, once a day. Ideally on an empty stomach & before breakfast. Children 6-12 years - One heaped teaspoon (5g) daily. Children 3-6 years - Half teaspoon (2.5g) daily. We do not offer a refund, replacement or exchange if you change your mind about a product or products you have purchased from SUPER discount supplements, so please choose what you wish to order carefully and make sure what you purchase is exactly what you need. If you are unhappy with the flavour of a product you have purchased we do not offer a refund or exchange.